Fiesta Inn continues to evolve, transform, and innovate its Business Class hotel concept. With a fresh, modern image and new facilities Fiesta Inn Ciudad de México Fórum Buenavista is the perfect example of business accommodations done right. Designed to encourage creativity and productivity, the hotel's spaces are functional yet friendly, allowing guests to be connected while remaining independent. Today's Fiesta Inn is more than simply a hotel; it is a community of professionals who thrive on success. The hotel is conveniently located in northern Mexico City on one of the most important thoroughfares, Avenida de los Insurgentes, and inside the Forum Buenavista shopping center. It is in the area designated as the Historic Downtown part of the city and is just kilometers away from prime attractions like the scenic Paseo de la Reforma and Alameda Central Park, as well as historical landmarks like the Zócalo, which is the city’s main square, and the iconic Angel of Independence monument. The industrial and financial areas of Vallejo are also just a short distance away. The hotel offers 129 guest rooms, 24-hour room service, high-speed Internet access, fitness center, dry cleaning service, covered parking with cost, and the 360° Lounge, which is home to the La Isla restaurant, B-On business center, self-service area, and a convenience store. We welcome guests with service dogs. Take a break and treat yourself to the flavors of La Isla, a 24-hour restaurant that lets you choose what you want and when. Offerings include a breakfast buffet, restaurant, grab and go, and room service. Try out our breakfast buffet or order off the menu at lunch or dinner, where you can choose from a variety of healthy yet practical options: salads, pasta, sandwiches, fish and more. Enjoy your meal in a modern ambiance decorated in bright and fresh colors for a pleasant dining experience. 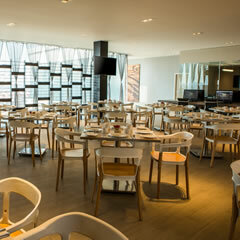 Guests are guaranteed to find a comfortable working area in the B-On Business Center, located in the 360 Lounge, which offers computers and office services along with wireless Internet for staying connected to the business world. 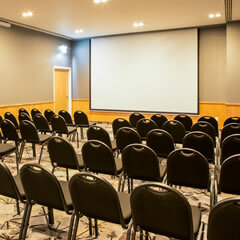 Also available are several comfortable meeting rooms for hosting video conferences or in-person presentations. The key to a productive stay is a relaxing place to rest. Make the most of your trip to Mexico City in this welcoming room that has everything you need to work and relax comfortably. It is equipped with a king bed, office desk and chair, telephone, wireless Internet, cable LCD TV, closet, coffeemaker, full bathroom, and air conditioning. The room also features a magnificent view of the city. This room has everything you need for a successful business trip and a relaxing stay. It is equipped with two queen beds, a closet, telephone, coffeemaker, wireless Internet, work desk with chair and lamp, air conditioning, cable LCD TV, full bathroom, and complimentary personal care items. Sit back and relax as you enjoy a panoramic view of the city. This suite has been designed to guarantee a productive stay and a restful environment after the work day ends. It comes with a king bed, work desk, closet, telephone, coffeemaker, wireless Internet, full bathroom, air conditioning, and cable LCD TV. You can also marvel at an extraordinary view of the city. This modern and spacious suite is the perfect place to work productively or rest comfortably. It includes a king bed, work desk, closet, telephone, coffeemaker, wireless Internet, full bathroom, air conditioning, and cable LCD TV. The layout features one bedroom and a living room with excellent lighting and unique decorations designed to make any guest feel right at home. We meet the needs of all guests to ensure that they have everything they need for a pleasant stay. This room comes with a single bed, work desk, closet, telephone, coffeemaker, wireless Internet, air conditioning, and cable LCD TV. The bathroom is equipped with safety rails in the shower, a raised toilet with safety rails, and extra-wide doors.